With the Z270 MPower Gaming Titanium Edition, MSI has a very well equipped motherboard in its portfolio, which comes with lots of features. There are for example three M.2 x4 Gen 3 slots. Apart from that this board comes with a great looking, unique design. Furthermore there are also some interesting features regarding overclocking onboard. As you might know already the Z270 MPower Gaming Titanium belongs to MSI’s latest flagship models, based on Intel’s Z270 Express chipset. Apparently it comes with an armada of features, such as three M.2 slots for example. Compared to the predecessor, which went by the name Z170A MPower Gaming Titanium, they’ve kept the color scheme, but improved almost every single little detail. The MSI Z270 MPower Gaming Titanium is based on an the ATX form-factor and there are your usual four DIMM slots. Compared to the previous model we find a plastic cover running over both the audio solution as well as the back I/O ports. Apart from that "Mystic Light" RGB lighting is supported, which allows to change the illumination of the board from within Windows. There are also three full-sized PCIe slots with steel reinforcements and they’ve been wired using x16/x8/x8 lanes. Between each full-sized PCIe slot there is a M.2 slot and one of them is covered with the MSI M.2 Shield which should help preventing thermal throttling of M.2 SSDs. The slots can hold a whole variety of M.2 drives and the longest of them could measure 110mm, complying with the 22110 standard. In the case of SATA ports you’ll find six of them, while they've all been angled by 90°. Like the previous model the new Z270 MPower Gaming Titanium comes with all the bells and whistles you’d ask for in the event of overclocking. There are onboard buttons and a debug display, slow mode, LN2 mode, CMOS button and much more. Also relevant for overclocking and extreme overclocking is the power design. MSI is using 12 phases from International Rectifier, making for an excellent power design. At a first glance this is certainly a good looking motherboard which could be perfect for high-end setups and extreme overclocking. 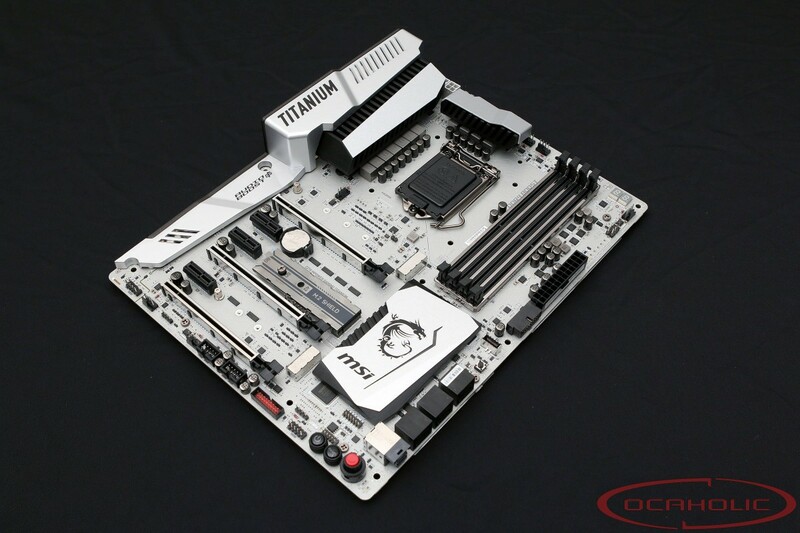 We’ve always been a fan of the MSI Titanium series motherboards. With the individual design they are different yet great looking. From this point of view, the only thing we would change is the I/O cover. Instead of plastic we would love to see metal. At this point it's time to have a closer look at this board and see how it performs.